I watched the Librarian movies long before TNT decided to make a series around the idea and liked them as well as the character Flynn Carsen. After watching the most recent episode "And the Apple of Discord" I realized he is the weakest part of The Librarians. Spoilers ahead. Flynn had a decent arc in the three movies so I had some hope for his role in the series. In the first movie The Librarian: Quest for the Spear Flynn is introduced as a lifelong college student with over twenty degrees who still lives with his mother and has never worked in the real world. After being chosen as the new Librarian he has his first encounter with the Serpent Brotherhood to prevent them from assembling the pieces of the Spear of Destiny. Along the way he ends up working with a woman who fits the role of Guardian though she's never called that. The usual romantic hijinks ensue. Flynn saves the world and has become a Librarian. In The Librarian: Return to King Solomon's Mines Flynn is a little more experienced when he goes in search of the mines and an artifact of great power. He meets a woman archaeologist with more degrees than him. The usual romantic hijinks ensue (though at the end the woman archaeologist goes her own way). Flynn saves the world and makes an important step in his progress as a Librarian. And in The Librarian: Curse of the Judas Chalice Flynn is a top notch Librarian but feels his personal life suffers from the sacrifices he's made for the Library. While on vacation he meets a mysterious woman and together they end up on the trail of a mythical cup (you can probably guess what it is). The usual romantic hijinks ensue (but again Flynn is left alone at the end). Flynn saves the world and accepts his role in the Library. 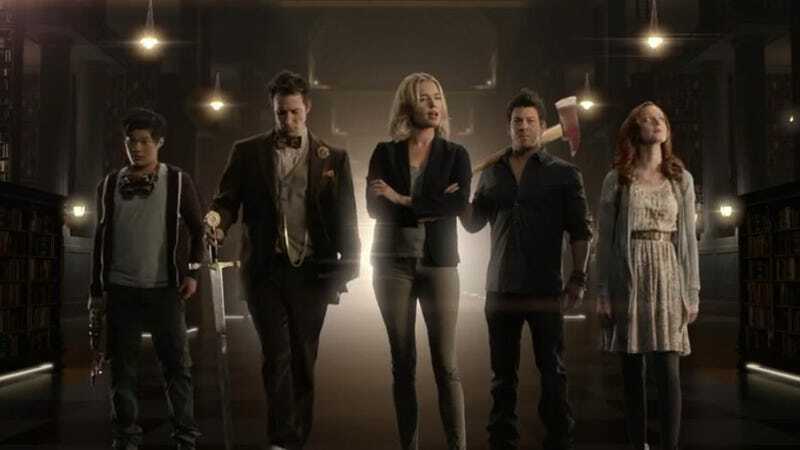 Since Flynn's story is mostly told already what do we get when he appears in The Librarians? While I didn't see it at first others correctly pointed out that Flynn is now effectively the Doctor. He has seen and done too much, thinks he's the smartest person in the room and in the last episode was at full David Tennant/Matt Smith manic mode. Doctor Who gets away with that but it doesn't really work for The Librarians. When The Librarians really works like it did in the Christmas episode it's because of the team. I haven't fully warmed up to Ezekiel but he has his moments of awesome like everyone else. But Flynn Carsen isn't part of the team and his presence is disruptive. Flynn has his own mission to find the Library for now but I'm sure he will still pop up occasionally. And what will happen after the current and final season of Falling Skies when Noah Wyle will have more free time? Will Flynn Carsen be showing more? If it's the same Flynn we've seen so far I hope not.